"This is a sweet and spicy stew that you start in the morning and let the slow cooker do the rest. 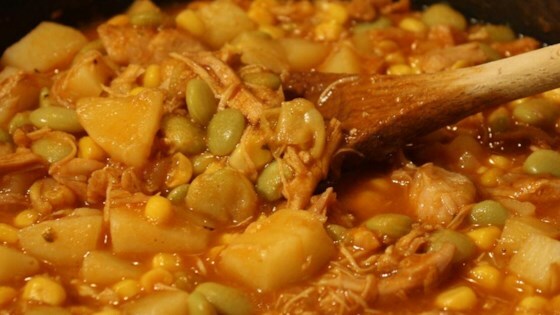 It is a great way to bring in the fall season because it is packed full of vegetables, pork, and butternut squash. It is perfect paired with cornbread muffins and a great way to use leftover pork roast or pulled pork barbeque! White potatoes can be substituted for the butternut squash." Heat oil in a large skillet over medium heat. Cook and stir onion and celery in hot oil until onion is translucent, 5 to 7 minutes. Stir garlic into the mixture; cook and stir another 2 minutes. Transfer mixture to slow cooker. Stir butternut squash, pork, diced tomatoes, baked beans, chicken stock, corn, peas, cayenne pepper, cumin, paprika, salt, and barbeque sauce into the onion mixture in the slow cooker. This is also a great way to use up leftover chicken! as others have noted, very sweet and too much liquid and over flowed my crockpot. it's an OK stew, though doubt anyone from Brunswick would call this their own. Hearty and delicious, but overly sweet for my taste. Recommend substituting navy or great northern beans for baked beans and reducing amount of barbecue sauce. It is even better and thicker as a leftover. But it didn't last more than two meals. Yumm!